THIS IS HECTIC HIGHWAYS! Make your way down 15 unique levels while jumping, dodging and weaving your way through daunting obstacles. Collect bonus stars by completing the objective for each level! 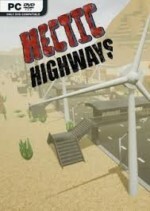 4 different environments will keep you on your heels as you survive the onslaught of trees, turbines, electric pylons and more on the Hectic Highways!